HELLO, SUNSHINE: Thanks to a whitewashed exterior and bright yellow front door, the simulated stone-and-stucco façade really pops. BY DESIGN: In the living room, a few strategic design tweaks made a big impact. A row of windows were swapped out for sapele French doors, strengthening the relationship between the living area and the outdoors. 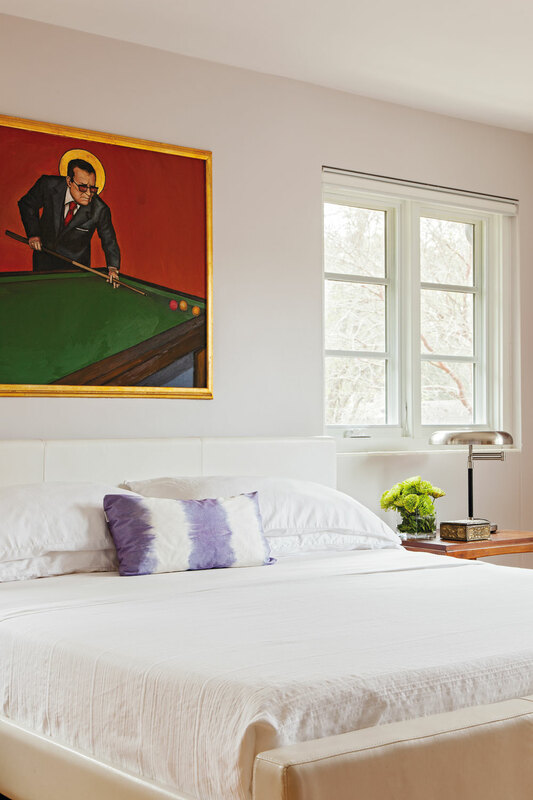 A chaise lounge was recovered in an eye-catching purple hue to suit the home’s new vibe. And built-in storage was added—its shelves vary in size to mimic the patterns of brick in the fireplace. DECKED OUT: An inviting new deck runs the length of the house and draws the family out into the backyard. EATING LOCAL: For a sleeker take on the traditional farmhouse table, Bryan Deel of Bryan Deel Timberwerks paired a hardwood top with a pair of Lucite legs. “COAT” d’AZUR: A wall of bright blue subway tile delivers a splash of color to the modernized kitchen, with new stainless steel appliances, custom cabinets, and Daltile countertops. ART WORKS: Christopher is on the board of directors at Redux Studios; his passion for art is reflected in the painting by area artist Bob Snead that hangs in the master bedroom. MASTER SPLASH: Green glass tiles contrast beautifully against the contemporary white vanity. 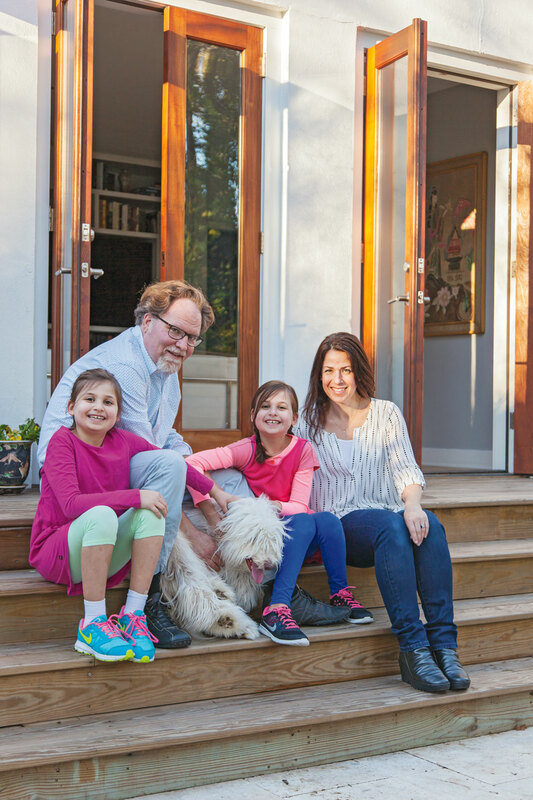 For the better part of the last decade, Christopher and Cat Morgan occupied a cozy brick cottage in Wagener Terrace. The neighborhood is populated with similar bungalows, so it’s no surprise that a nearby stucco-and-simulated stone number drew their attention—though not for the reasons you’d think. 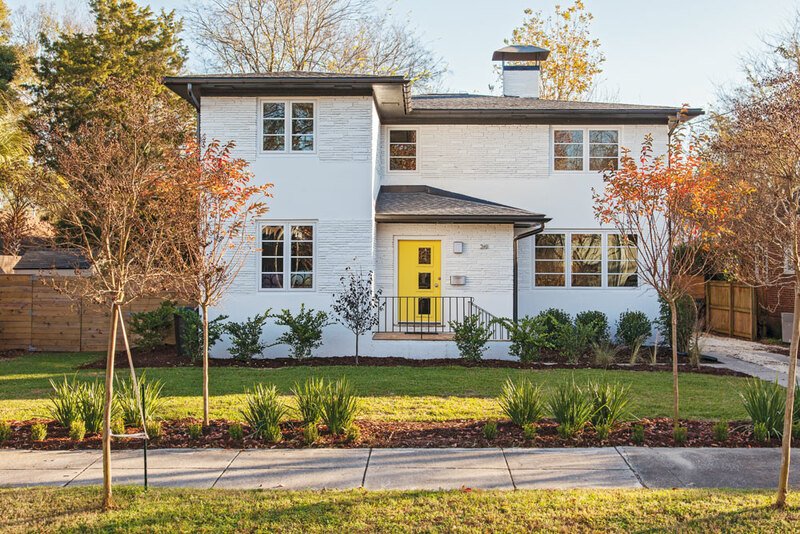 Today, the circa-1953 house certainly stands out from the crowd: with its geometric silhouette and sunny-yellow front door, it projects a vibe that’s a little bit mid-century Miami, a little bit California modern. For a moment, passersby can almost imagine they’ve stumbled onto the set of Mad Men; one half expects Don Draper to cruise by in a convertible with a perfectly coiffed blonde riding shotgun. But it wasn’t long ago that the residence gave off an air that was less retro-cool, more untouchable fortress. That’s when Christopher, planning manager of the City’s Department of Planning, Preservation, and Sustainability, first noticed it—for all the wrong reasons. “It was surrounded by a six-foot, chain-link fence topped with barbed wire, and two menacing dogs that would lunge at anyone walking past,” he recalls. “The neighbors called it ‘Alcatraz’ because, from the street, it was so intimidating.” With its tan stucco façade and neutral front door, the structure itself faded into the background; the spiky fence took center stage, sending a clear “don’t-mess-with-me” message that was in stark contrast to the eclectic homes that populate this otherwise friendly-feeling block. And so, even though Christopher was on the hunt for an abode with a larger footprint, he was initially uninterested when the 2,600-square-foot place hit the market in 2014. But his wife, Cat—a nurse who, before pursuing a career in healthcare, earned a degree in historic preservation—saw its potential and suggested they take a tour. “Within 30 seconds of being inside, we just looked at each other and nodded our heads,” Cat recalls. 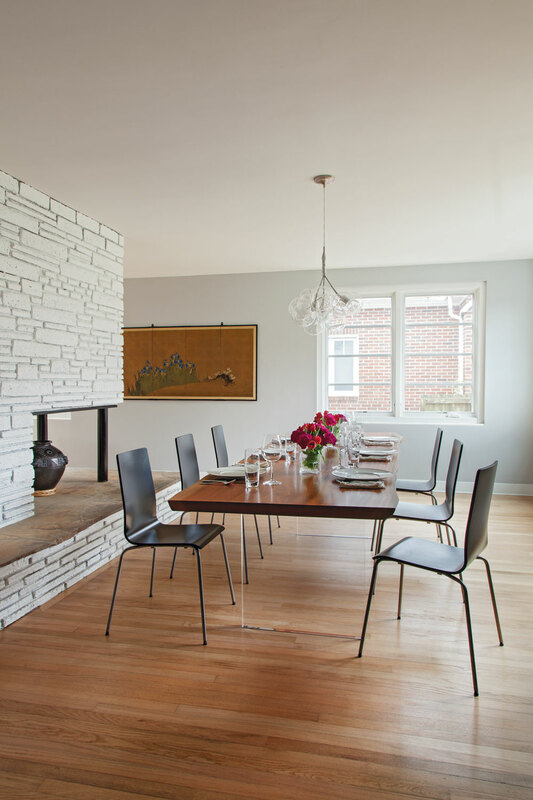 The couple was sold on the openness of the first-floor layout, which pivots around a double-sided stone hearth that wraps from the dining area to the living room. “That fireplace adds incredible texture,” Christopher says. They were also pleased to discover many original details, including ceramic tiles and hardwood floors, in salvageable condition. To top it off, the three-bedroom structure offered plenty of room for their eight-year-old twin daughters, Charlotte and Elizabeth, and bearded collie pup, Willow, to play. Once the couple got a peek at the home’s hidden charms, they were undeterred by its warts—including a roof in need of repair and an HVAC system that had been on the fritz for the last decade. They bought the place and immediately began working up plans to fix the problems, improve its curb appeal, and play up the home’s inherent ’50s character. The first step was consulting with Angie Hranowsky, a local interior designer whose flair for bright hues and mid-century silhouettes has garnered praise from national magazines like Southern Living and domino. 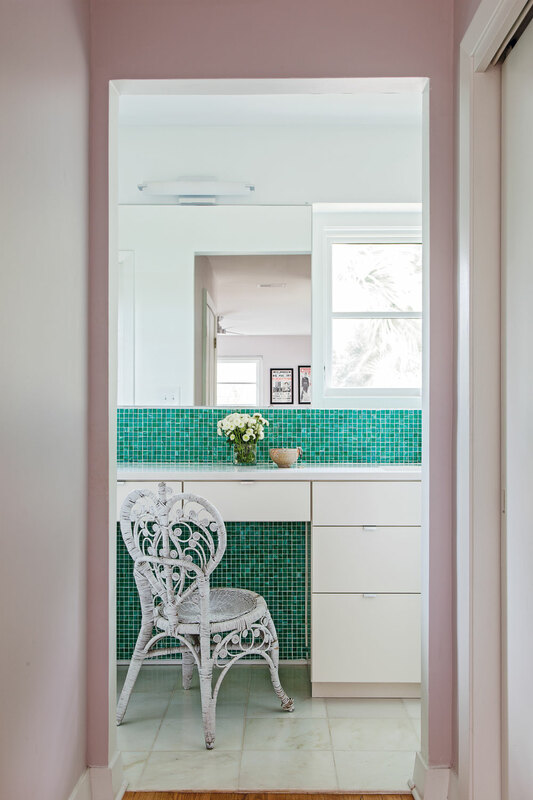 Hranowsky advised on what to save, such as the retro mint-green tile in the second-floor powder room. “Old bathrooms often have cool tile, so there’s no need to spend money ripping it out and replacing it,” Hranowsky says. She also weighed in on what to scrap—like the outmoded floral wallpaper—and suggested color palettes to be used throughout, including the striking yellow-and-white combo that would eventually blow the doors off the once-demure façade. Armed with Hranowsky’s input and their own strong design sensibilities, the Morgans assembled a team to help make their vision a reality, calling on local contracting firm Solid Renovations and area woodworker Bill Hussey. The group focused their efforts on underscoring the home’s existing high notes. For example, thanks to a row of windows overlooking the backyard, the living room already had a strong relationship with the outdoors. But when those original windows had to be replaced for efficiency’s sake, the Morgans upped the ante by swapping in glass doors. “The beautiful sapele French doors completely open things up,” notes Ron Krauskopf, a managing partner with Solid Renovations. 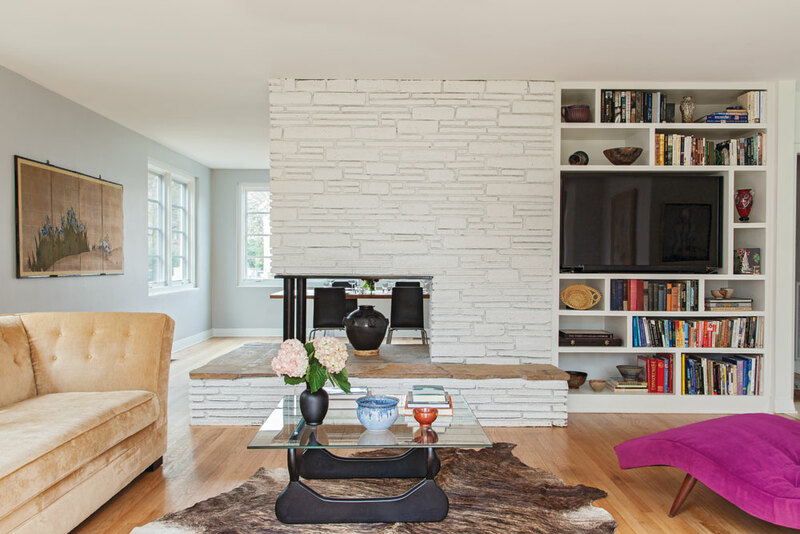 “They lead to an extended deck that really makes the back of the house pop.” In the living area, a few coats of white paint streamlined the aforementioned double-sided fireplace. And the hearth was further accentuated by a custom built-in with “shelves at random heights and widths to mimic the pattern of the brick in the fireplace,” Christopher explains. Though preservation of original materials was a goal throughout, the reno also aimed to update the house for 21st-century family life. The kitchen, for example, was gutted and redesigned. To increase flow, the crew tore down a wall separating smaller eating and cooking nooks. They then did away with the outdated appliances and cabinetry, replacing them with stainless steel and white custom contemporary versions. 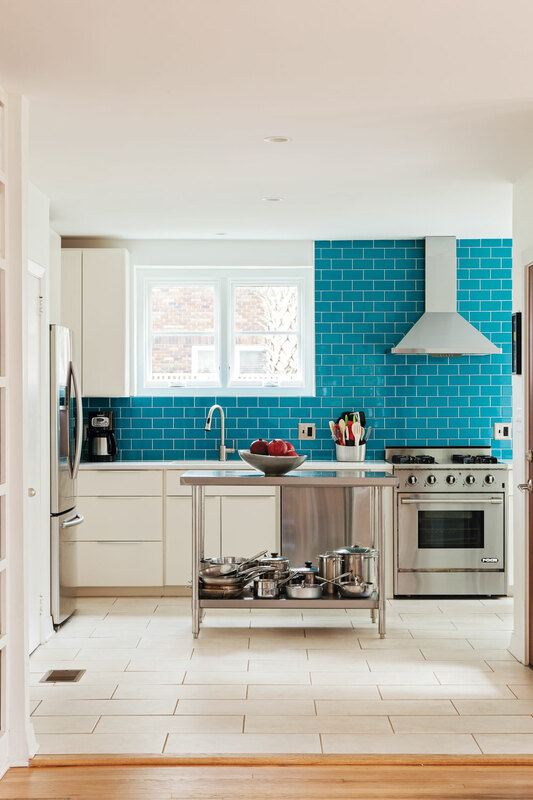 Subway tile in a brilliant shade of azure reflects the optimistic era in which the house was built. “We wanted it to feel happy and modern, with bright pops of color,” Cat says. When it came time to layer in interior design, Cat and Christopher took a DIY approach. “We weren’t going for a strictly mid-century look—we’re more eclectic,” Cat explains. The couple stuck with their own art and furnishings, with a few notable exceptions. For the dining room, the Morgans asked Bryan Deel of Bryan Deel Timberwerks to custom-craft a table from a single slab of hardwood and a Lucite base. Another favorite new furnishing belonged to the house itself. When touring the abode for the first time, Cat and Christopher noticed a striking mid-century serpentine chaise being used as a dog bed. They bought the piece along with the house, then had it reupholstered in an electric shade of purple, adding yet another bright spot to the interior.